Give your organization a reputation of paying attention to detail by not pestering leads outside your targeted demographic with endless messaging. Step down a tier in Marketo’s database-size pricing to immediately raise your marketing automation ROI. Instantly increase your lead quality by purging the bottom-of-the-barrel leads—those with a negligible chance of interacting with your organization, let alone purchasing a product. Begin your cleanse with these 5 steps and enjoy all the benefits of a healthier database. Lead Created: Before your timeframe of activity history. This is to exclude leads who entered the database recently but have not had a chance to engage yet. 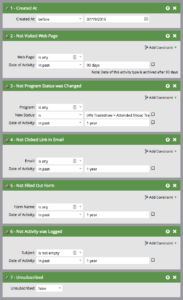 Not Program Status was Changed: New Status is a list of the program statuses that you consider to be engaged. “Tradeshow – Visited Booth”; “Webinar – Attended”; “Online Advertising – Converted”, among others. Not Clicked Link in Email: Is Any. If you are nervous about this one, you can use Not Opened Email to be extra safe. But understand that some email clients automatically open emails to classify spam, so you’ll likely get some false actives. Not Activity was Logged: Subject is Not Empty. 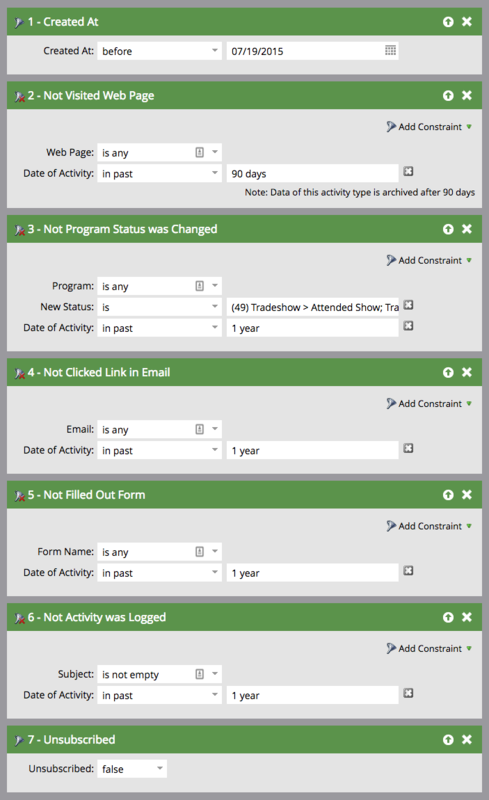 This filter will exclude leads who have had any SFDC activity in your timeframe. Unsubscribed: False. As always, you’ll want to make sure you keep your unsubscribed leads. That way you won’t message them if they find their way back into your database. *NOTE: One thing to remember here is that when using inactivity filters, you want to use the “ALL” filter logic. “ALL” turns the filters into “NOR” logic: they haven’t visited a web page, nor have they filled out a form. Take a look here for a visual of this smart list. I’d recommend using 1-2 years for the timeframe of the activity, as long as the type of activity is available that far back. (Some types of activities are archived after 90 days.) Experiment with dates and view the number of leads returned to help you decide how long you are comfortable with. Also take your sales cycle into consideration. If you have a very quick and transactional deal cycle, then you might want to shorten the time frame to 6 months. Take a look at the email address of the lead, and see if it’s a punctuation error you can fix (i.e. a comma at the end of the address, or two email addresses in the field). When you’ve fixed the address to a correct format, change “Email Invalid” back to “False”, so that you can attempt to message this lead again in the future. Once this is complete, make a smart list of leads who are “Email Invalid = True” to be used for removal. Don’t you want to know where all these useless leads are coming from before you purge them? Discover your low-quality sources with a simple Lead Performance report grouped by your Lead Source or Lead Source Detail field. For the smart list of the report, use two “Member of Smart List” filters and include the inactive and invalid lists built above. Sort leads “Descending”. Who’s at the top? You may not want to renew your contract with that vendor next year. Before you delete your leads, export CSVs of each smart list with all columns to back up all data possible. There’s no cost to keeping these leads, and knowing you can easily import the leads back into the database reduces your stress level when hitting that final delete button. Using the smart lists, highlight all leads and delete. Go ahead and remove them from CRM too, since you’ve included the SFDC inactivity filter. Don’t be nervous! Think of it as taking out the garbage, and enjoy a cleaner and healthier place to productively manage your leads.